Although Russia is known for its great works of fiction, new works captivate Russians with the stories of their own history. 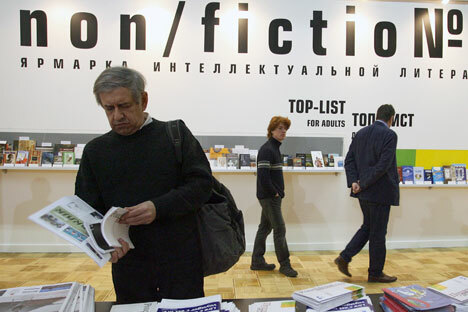 Russia, a country frequently defined by its epic novels, has witnessed a recent, prolific surge in non-fiction. A few literary and journalistic giants have taken to writing in a visual, documentary-like style. With titles like “Verbatim,” “Our Era” and “The Word en Route,” writers tell stories, some times off-the-cuff, of the Russia that’s true for them. Perhaps the most touching link between the authors of recent non-fiction books is the tie between journalist Leonid Parfyonov and writer Liliana Lungina, who died in 1998. Lungina was a widely famous and popular fiction translator who introduced Soviet readers to the masterpieces of Astrid Lindgren, Heinrich Böll, Boris Vian, Henrik Ibsen and many others. She befriended many leading Soviet writers and foreign authors whose works she translated. Her friends fell victim one by one to the Terror and were crushed or killed in Soviet dictator Joseph Stalin’s camps. She began to know fear, but she believed it was her duty to overcome it. Her house became a safe haven for the persecuted and the penniless, and she herself became a guardian and witness to their fate. Before her death, she told the story of her remarkable and spirited life, but for 11 years, there was no interest in her story—until Parfyonov and Boris Akunin got involved. The resulting documentary series based on her recollections was so popular in 2009 that it became a book, “Verbatim,” which has resonated deeply with readers this past year. One of Russia’s best-known television journalists, Parfyonov is a master of the documentary, weaving insightful history with closely glimpsed cultural trivia and, often enough, hilarious commentary. For the past few months, he has also become known as an open critic of state control over his craft. He has also been working on a five-volume series, titled “Our Era,” an encyclopedic exploration of the last five decades in Russia. Russian pundits called his speech a renewed perestroika manifesto. As the audience of “Our Era” has discovered, Parfyonov does not lack for passion or knowledge of his subject matter. He is known to wander from Gagarin’s space flight to the assassination of President John Kennedy, from the Prague Spring to the Vietnam War. He includes the 1980 Olympic Games in Moscow as well as Russians hooked on the soap opera Santa Barbara, nationwide Ponzi schemes and the craze for imported chocolate bars. As with any decent encyclopedia, “Our Era” is illustrated with high-quality, vivid and relevant photographs, which help the emerging Russian reader with the content. In a year especially prolific in nonfiction, the top national literary award in 2010, the Bolshaya Kniga (Big Book) prize, went to Pavel Basinsky’s emotionally profound biography of Leo Tolstoy, “Flight from Paradise,” dedicated to the 100th anniversary of the legendary author’s death. The immediate and sustained public interest in the book is all the more remarkable considering the lack of any officially sponsored high-profile events. Basinsky received high critical praise for his work, which will be published in English. Tolstoy wasn’t the only literary giant getting a second look this year. The Limbus Press Literary Agency in St. Petersburg published a thought-provoking collection that features modern writers discussing the life of their predecessors. Poet and critic Dmitry Bykov wrote the section on Maxim Gorky; novelist Lyudmila Petrushevskaya wrote about poet Alexander Pushkin; and artist and novelist Maxim Kantor wrote about satirist Mikhail Bulgakov. More than 40 authors were included. The upcoming English translations of these articles are likely to be selective and, thus revised, the book may prove to be even a more entertaining and focused read. But Russia itself was not the only subject that is resonating with readers, as is shown by the popularity of Peter Vail’s “The World en Route.” Vail emigrated from the Soviet Union in 1977. He lived and worked as a journalist in the United States and then in the Czech Republic. He was a passionate globetrotter even at a time when the Soviet Union was still locked behind the iron curtain. When it collapsed, Russians eagerly flocked to the foreign lands that had been tantalizing but inaccessible for about 70 years. While some were content with shopping trips and sea resorts, many sought more sophisticated discoveries, which is where Vail comes in. His travel columns and books published in Russia swiftly gained enormous popularity, breathing the balmy air of far-away lands. Vail gave people the impression he had seen all the cities and provinces in the world, and could talk about them with esoteric aplomb. Peter Vail died in late 2009 and in 2010, Moscow-based Astrel Publishing House came out with “The Word En Route,” a combination of travel notes with essays on art history. In his last work, Vail takes the reader on a post-Soviet journey that includes Armenia, Russia, and Western Ukraine, with the same exceptional talent for being genuinely surprised, kindly ironic and sincerely involved.